Habitat: Marigold is native to southern Europe. Now it can be found in warm and temperate regions of the world. It prefers full sun and a well-drained soil. Description: Marigold is an annual plant, growing to 80 centimeters in height. It has oblong-lanceolate leaves, slightly toothed and hairy. They are pale-green in color. The inflorescences are usually golden-yellow or orange, with a thick flowerhead and a ring of ray florets surrounding the central disc florets. Flowers have a strong and unpleasant odor. The fruit is a thorny curved achene. Useful components: Triterpenoid esters, carotenoids, saponins, resins, essential oils. Medicinal use: Marigold has anti-inflammatory, antiseptic, antifungal and antispasmodic properties. Used externally, it is an excellent healing agent and can be used to treat bruises, burns, wounds, eczema, sores, skin inflammations and hemorrhoids. It can soothe pain and swellings after wasp or bee sting (just rub the affected part with Marigold flowers). As an antifungal agent, it can be effective remedy against athlete’s foot, Candida and ringworms. It is a beneficial herb for both internal and external ulcers. 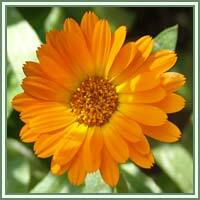 Used internally, Marigold can help in cases of gastric ulcers and various infections of mouth and throat. Used in form of a tea, it can improve digestion, soothe menstrual cramps and help in cases of liver disorders and constipation. 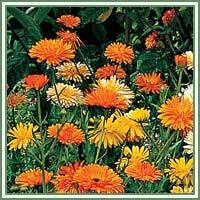 An infusion of Marigold is said to help in treatment of colitis and symptoms of menopause.